DNA recovered from a body buried in Montana 12,600 years ago has been linked to modern American Indians, and its ancestry has been traced back to Asia. Researchers have recovered DNA from a baby buried in Montana 12,600 years ago and linked it to today's American Indians, as well as other native peoples of the Americas. 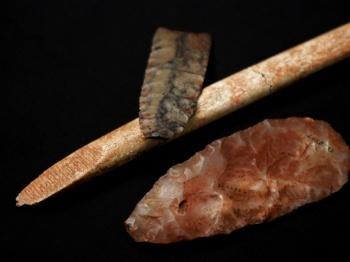 Based on artifacts found with the body, the boy is believed to have been a part of the Clovis culture, which existed in North American from about 13,000 years ago to about 12,600 years ago. The boy's genome is the oldest ever recovered from the New World, and it revealed that his people were direct ancestors of many of today's native peoples in the Americas. While the skeleton was discovered in 1968, scientists have only recently developed the ability to recover and analyze complete genomes from such ancient samples. The DNA also pointed to ancestry originating from Asia, which lends further credence to the standard idea of ancient migration to the Americas by way of a land bridge that has long since vanished. According to Dennis O'Rourke, an ancient DNA expert at the University of Utah who wasn't involved in the project, the results of this research will "raise a whole host of new ideas and hypotheses" about the early colonization of the Americas.